I'm on two wheels: Ride on John-We will catch up. Ride on John-We will catch up. 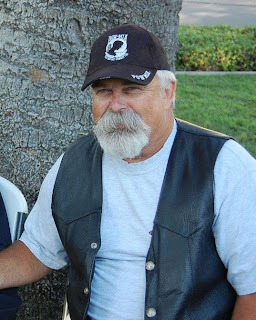 Some reading this knew John Ruhland a fellow motorcycle rider and close friend, and some of you did not. What's important to me is that you might appreciate the note I wrote for the funeral services on his passing on June 14, 2012 from a Cardiac failure due to coronary blockage. Attending his services today 6/25/12, I had hoped to read this but due to limitations was not able, a portion was read to those attending his funeral by our STAR president as part of his remarks.. It looks like we lost our tail gunner John, he twisted the throttle and pulled on ahead, A bit impatient as usual, and now, he’s nowhere to be seen on the road unwinding in front of us. He was with us, right by our side, just a bit ago and now he seems to have gone on ahead. I can’t see him on the road stretching out in the distance but I know he’s up there speeding on ahead, his face in the wind, those short sleeves and the leather vest flapping as the wind whistles past the front of his motorcycle. –with no windshield! Or wait, could that rider be him just cresting that distant hill ahead. but that’s OK, we are traveling in the same direction, so I know I’ll catch up to him at the final destination. It will be great to see him again, the big smile, the rosy cheeks, bright eyes and his quiet voice, laughing as we pull in to gather around with a big greeting for everyone. We will keep an eye out for you on the road John, when we come to an intersection or rest stop and feel your wind in our face, we will know you have already been there just a little bit ahead of us …we will catch up John, we will catch up. Richard you need to do this for John but also for all those who never experienced the road as you and John did. It will be hard but put your helmet on, straddle that seat and ride with the wind for John is Your wind. He would be happy you shared your experiences with all. I will pray for your strength, your words but most of all your love for John.